Tangle free and pain free! Keep your hair looking its best with the Beurer Ionic Detangling Brush, which provides a smooth, soft-touch surface to comb and gently untangle your hair. 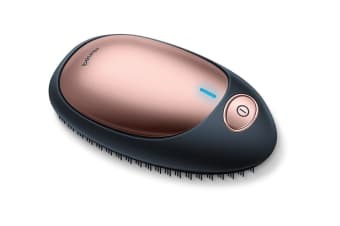 The Beurer Ionic Detangling Brush is a compact, battery operated tool that can be used to painlessly untangle your hair – which means it’s the perfect addition to any handbag! Featuring a soft-touch / velvet surface, the Ionic Detangling Brush using soft acrylic bristles to gently detangle your hair and leaving your feeling as great as you look.